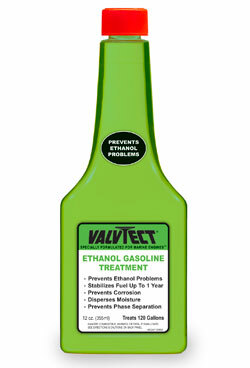 ValvTect.com features details on the new ValvTect Ethanol Gasoline Treatment. According to ValvTect, ValvTect Ethanol Gasoline Treatment has been verified by engine manufacturer and ASTM tests to stabilize gasoline, prevent corrosion, control moisture to help prevent phase separation, reduce octane loss and clean-up carbon deposits. Ethanol gasoline destabilizes quickly and can prevent starting, cause stalling and plug fuel filters. ValvTect says the ValvTect Ethanol Gasoline Treatment is test proven to stabilize fuel for up to one year. Annual Outboard Engine Service – Do It Or Don’t?